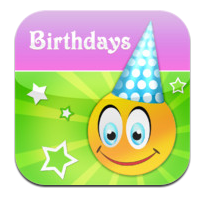 Birthday Calendar Pal is an iPhone app developed by 321AppsLabs. This stupendous app is a time-saver, and possibly a friendship saver as well. With Birthday Calendar Pal, you can set up all your Facebook birthday greetings in minutes! 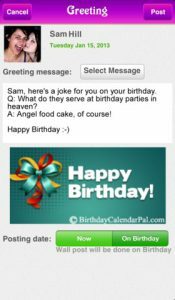 Using Birthday Calendar Pal, you can set up your birthday greetings for an entire week, an entire month, or even for the whole year ahead! We’ve all felt bad after forgetting someone’s birthday: now, this app helps to make sure that nobody’s feelings get hurt over a forgotten birthday. Overall, the UI here is perfectly suited to the app. 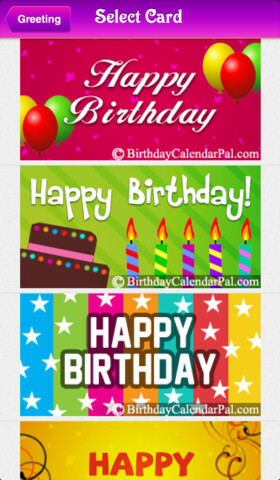 The Birthday Calendar Pal interface looks like a birthday party, with tons of bright colors like green and purple. I do wonder if a lot of guys will use this app: it isn’t the manliest-looking app out there, though it serves an important function. Calling the missives that Birthday Calendar Pal sends out “messages” simply doesn’t do them justice. These “messages” are fantastic full-color cards, complete with birthday jokes/messages that are appropriate to your relationship with the recipient. 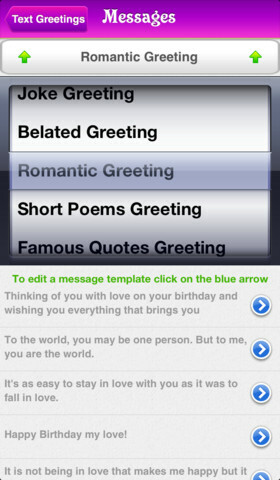 You can choose cards that are perfect for romantic greetings, funny greetings, or sending belated birthday wishes. There are also short poem cards, which would be perfect for parents or grandparents…and I think the famous quotes work great for teachers, professors, or trivia buffs. Importing your friend’s birthdays from Facebook is super simple, and doesn’t take very long at all. Once you’ve done that, you can easily see who has upcoming birthdays. And with over 100 different greetings to work from, Birthday Calendar Pal has a birthday card template that’s right for all of your friends! If you send a birthday greeting through this app, you’re guaranteed to stand out from the pack. 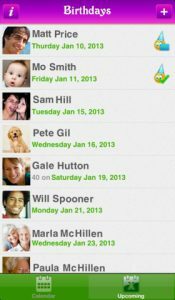 Birthday Calendar Palis compatible with iPhone 3GS, iPhone 4, iPhone 4S, iPhone 5, iPod touch (3rd generation), iPod touch (4th generation), iPod touch (5th generation) and iPad. Requires iOS 4.3 or later. This app is optimized for iPhone 5.